Aikatsu Friends! – 031 | Mezashite! Hand-holding and first names, that’s anime for falling in love. How lewd. Just confess already god dang it. Can’t wait for Aikatsu Fortnite next week. I hope they’ll have Mio do some dance emotes. sometimes I (almost) can’t believe how much it’s coded like they’re dating. When are you guys gonna kiss? So this week we got the lesbian deathmatch episode and next week we are getting the lesbian idol battle royale episode. Nice. Jokes aside, this was a fantastic episode, really happy for the girls. I just wish they had shown some of Honey Cat’s tour before the ending of this arc, but oh well. The lack of focus on Honey Cat seems to imply they will lose (which would not be unexpected at this point), but I’m still convinced that all four main units will partecipate in the DFC somehow. I have a lot of things to say here, almost all of them positive, but it also solidified a lot of my earlier complaints with the show and made their criticisms feel justified. It is, however, one of the few episodes of Friends I can say was good from start to finish—an episode I wish the rest of the show was more in line with. Before I can compliment anything, I have to once again criticise the overall pacing of the show. I personally do not think 3-4 episodes was enough to show a ‘break’ for Pure Palette. It’s possible Yuuko originally planned this show to be 100 episodes like Stars but learned she wouldn’t have as many episodes to work with halfway through, or that the cast would be changing at 50, because the pacing went from that of a 100-episode anime to a 50-episode anime somewhere around the end of the first cour. I basically think Yuuko is a much smarter writer than Friends has made her out to be, and a part of me almost has to wonder if there’s something going on behind the scenes here. I didn’t hate Yuuko’s previous episodes for the show (16, 21 and 28), but they didn’t seem to me like the show she wants to write (1, 9 and here); instead, they came off to me as shakeups or corrections of the work of other writers on the team, and attempts to redirect the focus of the show. The transition with 28 into this Pure Palette mini-arc was very abrupt, and I would say she was dealt a raw hand and made the best of what she could. I also felt she was dealt a very raw hand on this episode, but she did an excellent job with it and wrote probably the best script to pick up where the scenario had left off. In particular, she came up with a very compelling way to bring Pure Palette back together without making it seem contrived or too sudden and executed it as best she could, and clearly laid out the structure for the rest of the show while she was at it. With this roadmap and her continued guidance, I don’t think it’ll be possible for the writing team to disappoint me as badly as they did during the late second cour and early third cour. It’d just be too hard for them to stray too far from the light. What I mean to say is that this episode very much felt like a return to the Stars form and almost a different show entirely than what we have been getting for weeks, setting Kyogoku’s episode aside. Whether you agree with me or not on Friends, you love the show or hate it, I think you’d find it hard to deny that the approach in writing and directing here is fundamentally different to the one we’ve been getting for a long while. We are seeing less focus on Friends and more focus on the characters behind the Friends, or what is responsible for Friends. Rivalries have also been mostly between Friends Units this season, but this episode brought them back to the forefront. Notable was its insistence that a rivalry is, in its own way, the closest form of Friends you can be, and the episode was FINALLY resolved almost directly through competition or the existence of a conflict rather than the elimination of a conflict. The outright friendliness and lack of serious, straightforward conflict is a big part of what’s kept me from getting emotionally invested in the show. I just don’t get why everyone is so nice to each other and so open… or at least open with each other until not talking and properly communicating your feelings serves as an opportunity to fuel drama, as in the recent case of Aine and Mio. I’d say it’s too late for Friends to fully win me back now, but it’s nice seeing the season finally get over its hump and at least seem like it has a decent grasp on things and a solid future ahead of it. There’s a lot more potential that can be made of it, and I’ll be happy if even some of that potential is realised. 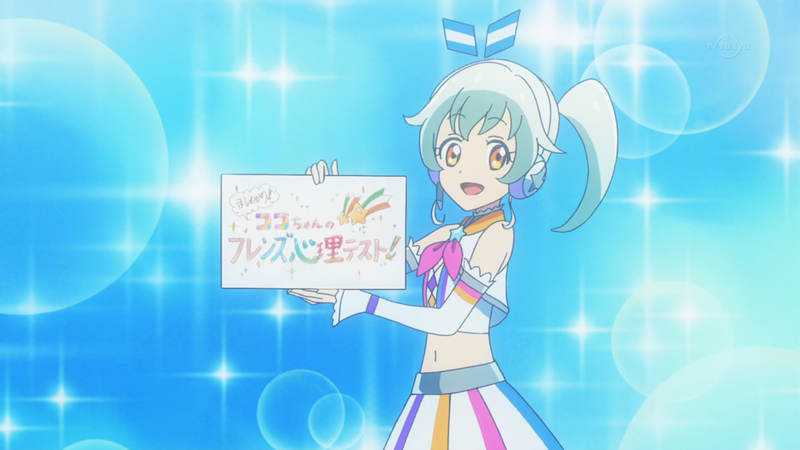 I’m definitely still enjoying the show for what it is and I think Aikatsu will always have a special place in my heart. Luminas lost to Soleil. The world (and the series) didn’t end. Unless someone has specifically stated that Friends will definitely end after 50-ish episodes, I expect it will continue to 100. How much do ya wanna bet that at the friend’s cup that love me tears will win by using that power that Aine used in that episode. If you mean the Diamond Friends Cup, and Aine’s “tomodachikara” power, I suspect LMT will win THIS time around just due to more experience. Aine and Mio still have plenty of room for growth in their Aikatsu.